Fly-by-road in a Sleeper coach! It has always been a long-standing dream to travel by a sleeper bus. For once, I avoid traveling by Sleeper class in trains, just for the condition of the coaches these days. Sleeper bus always evokes mixed response among passengers - some love them, while some others throw-up at the very thought. 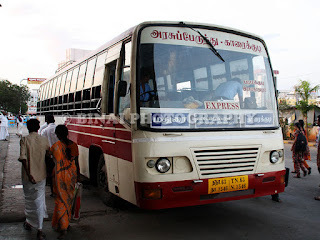 Every time I planned of a journey by bus, Sleeper buses were never an option - they either did not operate on the route I wanted, or they offered only non-ac variants. The only AC Sleeper service does not drop me inside Thrissur, but only at the By-pass. Traveling from the by-pass to the bus station is a nightmare, and is best avoided unless essential. 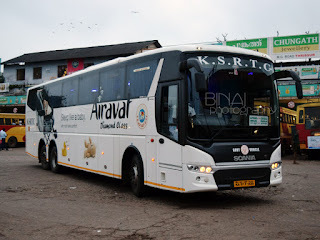 Cut short the crap: While searching tickets for my trip to Bangalore, I came across this new class of service on the Karnataka SRTC website - "Corona AC Sleeper". I almost jumped up in joy on seeing this. However, I had to ditch the sleeper halfheartedly to travel with my classmates in a normal bus (a Volvo, albeit). After my classmates withdrew from the trip, it was all my choice to select on what ever bus I wanted to. I headed straight to the reservation counter (Thekkel Enterprises, Ernakulam) to make my reservations. The online booking system does not let you travel on different classes when you book up and down tickets together. However, the agency's access allows you to book on different classes on each leg. Reservations were quickly made on a Volvo for the outbound, and the Corona for the return. Booking both legs together gave me some savings in the form of a discount. The outbound journey was described earlier (Read Here). My return bus was scheduled to depart from Shantinagar at 2045 (the bus starts from Mysore Road Satellite terminal at 2015). Given the punctuality record held by Karnataka SRTC, I was expecting the bus to turn up no earlier than 2100. But, not willing to take chances, I left home by around 1950, accompanied by my Brother and sis-in-law. Roads turned out to be empty, very unusually, and we reached Shantinagar by around 2010 - a distance that usually takes no less than 45 minutes during normal days. Shantinagar Bus station was a beehive of activity, with a set of buses parked in every possible corner and another set continuously entering and departing. Two police constables were seen standing guard and a couple of KSRTC Security Guards managing traffic. The high number of passengers at the bus station meant that the drivers had to be doubly-cautious in every movement they made - lest they run over someone. 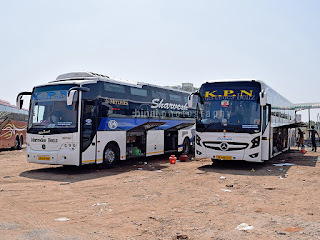 Buses originating from Shantinagar were brought for pick-up as much as 60 minutes in advance - buses that were to depart at 2140 were already at the bus station, by 2030. The clock ticked past 2040, and I made a quick visit to the enquiry to just confirm that I was standing at the right place - they replied positive. A Rajahamsa heading to Ernakulam arrived around this time. My bus arrived at 2100 - I was glad my belief came true. There was a chaos during boarding, with the conductor no where in sight. He turned up all of a sudden and started checking tickets. The driver was insisting we board the bus only after the tickets were checked. There was another confusion with their tickets not mentioning if their berths were lower or upper. My first impression on getting into the bus was - WOW! Never expected an Indian upstart company to make such a quality product. I waved off my brother and settled on my seat (err! Berth) - that was #6 a lower berth. The bus slowly inched forward at 2107. The engine noise did penetrate deep into the bus - but was not irritating. The bus did appear a bit out of breath at up grades, but the ride was comfortable. Minor potholes were effectively isolated from the passengers. The road had little traffic, unusually and hence the bus kept going at a decent pace most of the time. My bus had only one seat vacant - 31 out of 32 berths were occupied! Soon after the bus pulled out, the conductor came around distributing bottles of water. Blankets were already kept on the berth. I switched on my laptop and settled watching a movie. The AC vent was placed in an awkward manner - and hence wasn't very effective. The berth was not turning hot in any manner, but wasn't getting cool evenly. The driver picked speed at a mad pace and we were doing speeds in the range of 80~100 all the time. I was so engrossed in the movie that I did not notice crossing Hosur. We stopped for a break at a place called "Ramapuram", just before Krishnagiri - at 2240. The parking area was choked with atleast a dozen buses fighting for space. My bus was parked in an awkward manner, and the driver went off for his dinner. I went about on a Photography spree. We started off after break at around 2305. I was back to the laptop continuing the movie. I finally hit the "bed" at 0030. Oh boy! The berth was absolutely comfortable. The size was comparable with the ones on the Garib Rath - but were far softer. It took me some 15 minutes to get accustomed to the sways of the bus. The retarder was of great help, and helped passengers remain on their berths even when the driver attempted sudden braking. I slept off soon after I hit the berth. I woke up when the Airconditioners switched off all of a sudden - the time was around 0400, and we were near Neelambur Toll Gate, on the Coimbatore by-pass road. The bus quickly pulled over to the left side, and the driver was seen walking around the bus. The engine was shut down, and restarted, but the driver was sensing some trouble. A Karnataka SRTC Volvo pulled over to check if we needed help - but our driver managed to solve the problem. The AC was back, and we started off. I slept off once again - only to wake up at 0530 at morning. I decided to quit sleeping for the day and sat on my berth looking out. The bus once again pulled over - around 0615 - some where near Kuthiran, between Palakkad and Thrissur. This time, a couple of passengers had requested a "leak" break. I utilised the chance to get some photos of the bus, and had a short chat with the driver. The driver was complaining about some fault with the retarder - which was why the bus had stopped over that morning. We were off soon, and continued our run to Thrissur. During the 'leak' break, at morning. The bus attracted quite a lot of curious stares - including the highway patrol. We turned off the highway, and heading towards the bus station. We finally landed up at Thrissur Bus Station, at 0650 - 55 minutes behind schedule. What hit me off for a six was the number of people waiting to pounce on the bus - while only about 5 people alighted, not less than 20 people boarded the bus at Thrissur. The conductor was surely laughing his way to Ernakulam! To conclude: The Corona is surely a good product - considering the fact that it comes from an Indian company. The product has too many similarities to the Volvo - right from the frontal design to the layout of the driver cabin. However, the product is ultimately a value-for-money proportion for the passenger. The ride quality was amazing, and the bus felt confidence inspiring. Way to go Corona! Hope KSRTC does not disappoint me the next time with bad maintenance. Did they provide blankets on the Corona? @Sunup: The post mentions blankets already: "the conductor came around distributing bottles of water. Blankets were already kept on the berth." @Binai: Thanks very much for this post and the photos; it helped when I was wondering what the "Corona AC Sleeper" was. how are two births placed side by side? i hope there is partition between people sleep side by side. Road Rules: Tips for Driving in Kerala!